Yesterday started out just like a regular day. Then a friend called and invited us to go to the Music Circus. Oh Yeah!! Drop everything! That sounds like a whole lot of fun! And, it was! 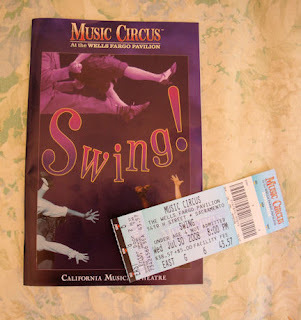 The show was "Swing" and it featured the wonderful music from the fabulous 40's. 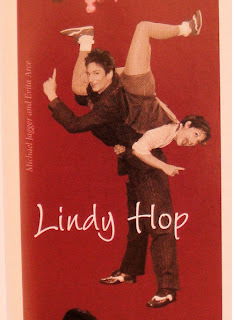 It was wildly energetic (how do the dancers do it?) and the music....oh wow! They were doing all the fun dances, the girls were being thrown up in the air and twirled above the guys head. It just looked like a complete blast! Everyone was bouncing along to the music. It wasn't all fast paced. There was one song in particular that was so heartfelt that I still feel emotional just recalling it. "I'll be seeing you", do you know that song? It's so sweet and meloncholy. I felt completely caught up in the song and then I heard someone behind me gently singing along. At that moment I realized that while this music was a favorite of mine, it was nostalgic to the generation that experienced it. How wonderful to have your own special time in history come to life in such a spectacular way. 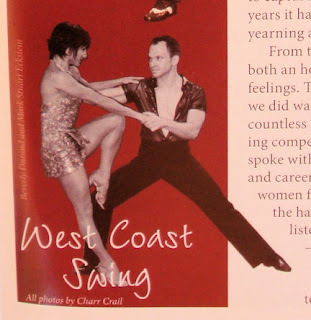 Oh to be able to dance like that.....what would that be like? I can only imagine the thrill of it! We are so blessed to receive this special gift. What a nice suprise! 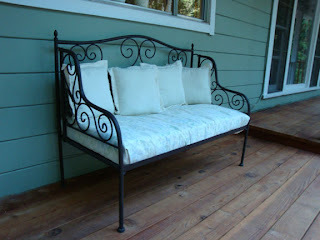 Isn't this bench so cute? And, I didn't even buy it. My husband thought it would make a great prop for his photography business, and it folds up. I generously offered to "store" it for him....on my front porch! It has a really nice cushion that I wanted to protect, so I put a waterproof twin mattress cover and on top of that a canvas type fabric that I made a table cloth out of. The pillows are from a garage sale, I had no idea what I was going to do with them. Aren't husbands the best? 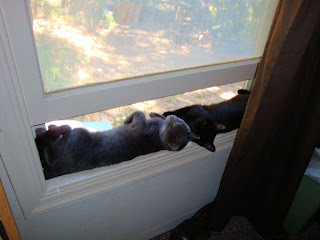 Kitties in the window. Aren't they cute? We are "babysitting" for my son. I think it will end up being permanent. We're getting pretty attached! I'm going to my sisters wedding. She asked me to wear black. Well that solves the problem of what to wear. New problem. Shoes. May I say that I miss shoes. It's come down to shoes I want to wear, would love to wear, shoes to die for...vs shoes that don't hurt. In the category of "shoes that don't hurt", there is a complete lack of inspiration and fashion. 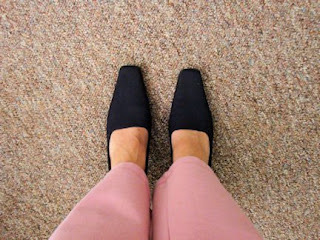 I want to wear a cute, high heeled, pointy toed, incredibly awesome shoe. Instead I am going through my options to choose the least offensive pair. 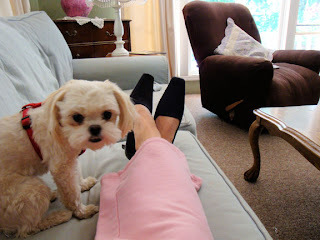 Here I am in my daily uniform of sweat-pants. Not the worst, old, ugly sweatpants, these are from the GAP, so they can't be all that bad. And, paired with my outfit, is a never actually worn pair of black, not-so-high heels. Maybe, just maybe, they will 'break in' and I will look acceptable at my sister's wedding. Before wedding To Do list: eat less, exercise more, lots of sunless tanning and major stress about wardrobe, hair, makeup and accessories. And then there is the family. Weddings have the power to heal past hurts and they have the power to open old wounds, or create new ones. My Mother is not going to go. There. I've said it. I have tried to talk her into going. Why would she even need to be coerced? This is her daughter after all. As a daughter, as HER daughter, this hurts. If I were getting married, would she NOT come to my wedding? Wait! I DID get married, and she did NOT come to my wedding. It will be 25 years this fall, and it still bothers me to this day. Will it bother my sister? I hope not. After all, there are some things you just can't change, no matter how badly you wish to. On a happy note, the weather is AWESOME and I am grateful for my husband and my kids, all grown, all happy, all wonderful. Got to go. I need to walk around some more in my almost cute shoes. My husband actually likes to go to yard sales. That is what he tells me and I accept it without hesitation. I think he believes that one day he will find TREASURE! At almost every sale, he asks if they have any "militaria"...old military items. One day...he will find it. Meanwhile, I find treasure almost every time we go. And, yesterday was a great treasure day! First up, I bought a salad bowl set. 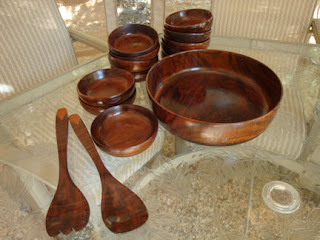 I did not need a salad bowl set, I LOVE and adore the one I have, even though it only has 4 bowls. This salad set has 12 bowls! And, it is very pretty. 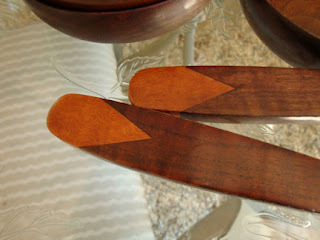 I really appreciate the in-laid wood on the handles. Very pretty. 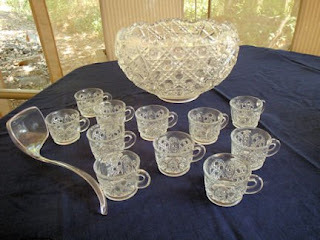 At the same Estate Sale, I picked up a punch bowl set. 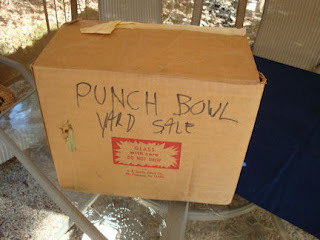 I also already have a punch bowl set. BUT, the one I have is plastic...uck. 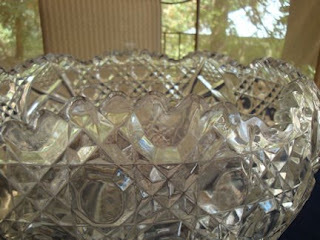 It has come in handy many times and every time I use it I remind myself to get a "real" punch bowl. Keeping that in mind, I could not resist buying this one. 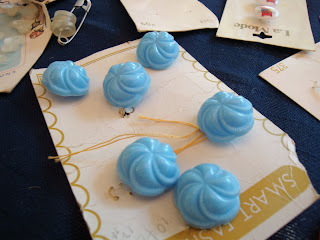 The pattern is called Daisy Button. The bowl is HUGE. And, it has scalloped edges at the top. It came with 12 cups. There are 12 empty spots for cups. 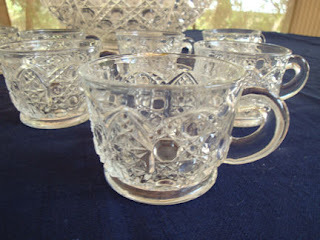 I will be searching for cups to complete the set. I've already checked out ebay. I won't rest until I have every slot filled!! I'm so glad that it was still in it's original packaging. 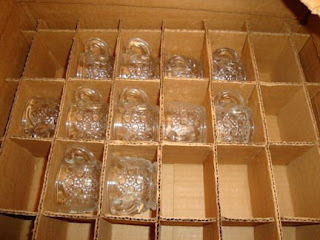 Great for storing away. 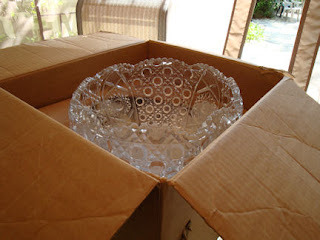 I could have bought a new punch bowl set. I imagine it would have cost more than I paid for this one. But, I like the idea that this set has already attended a few special occasions. It was someone else's "treasure". 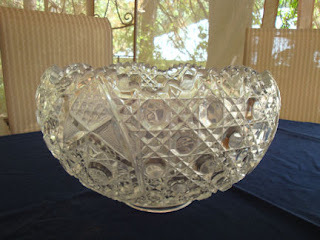 Don't you think that person would be happy to know that I am going to cherish their punch bowl? I think so. Can you believe it? 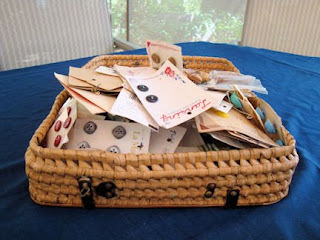 I bought somebody's button box!! I cannot have too many buttons. 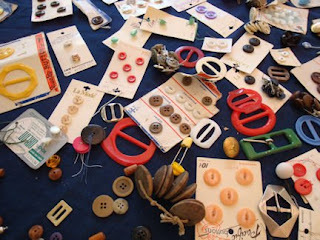 This may be because I used to enjoy playing with my Grandma's button box when I was a child. I was so excited about this treasure. The lady was selling them as individual items. I asked her if she would sell be the entire basket and she replied with "make me an offer". I know I should have become ruthless and made a ridiculous offer, but alas, I could not. I began to fret out loud about how I wouldn't want to offer the wrong amount etc. The husband was behind the woman and he smiled and held up 3 fingers. I quickly offered $3 and she said yes. The button basket was mine! Wow, there were a lot of buttons in that small basket! 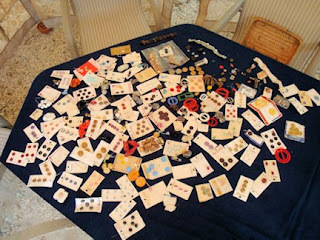 Each one a small little treasure! Fun and funky, old, maybe some vintage. Who knows where these will end up!! 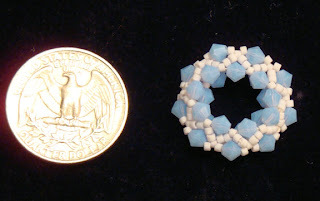 This bead is so fun to make that it's like potato chips.....nobody can make just one!! 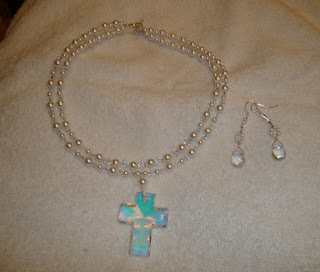 Then I made this necklace and earrings.....I'm on a roll!! And, YAY, it feels so great!! 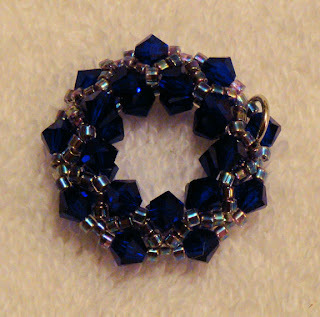 I got tired of jewelry....and I decided to sew something. I made a cute sundress, I'll try to get a picture. I was telling my daughter (the newlywed) about it, and she ACTUALLY expressed an interest in sewing. My mind immediately started working. I thought I might buy her a sewing machine. After I got one for my daughter-in-law, she started making things. And, that has been a wonderful way for us to 'bond'. While I was having all of theses thoughts, I had to fill up my gas tank and it was OVER $75!!!!! Maybe I won't buy her a new machine after all. Then I had a thought. 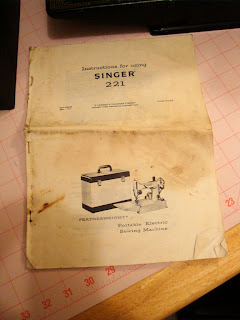 What about my old sewing machine? I thought i had a broken cord, but when I pulled it out, it was PERFECT! 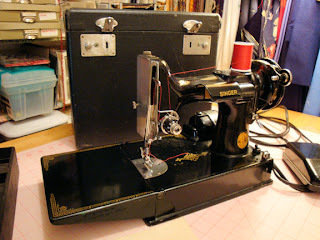 What pretty little sewing machine. 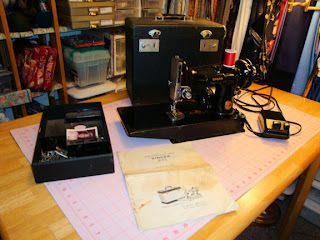 That sewing machine and I have gone through so much together. I got it when my daughter was under a year old and she is now 27!! If the machine had been new then...it would be old now. But, it wasn't new then...it was already an antique! I wanted a machine so bad. But, I couldn't afford one. I came across an ad in the sale paper for a sewing machine for $50. I called the lady (I was so excited!! 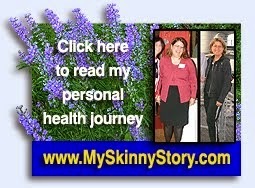 ), she told me all about it. I shared my worries with her over the phone....I didn't have a car....by the time my husband got home and drove me over, surely it would be sold. So, that sweet lady offered to drive over to my house with the machine. Can you believe that? She sat down at my table and showed me how to work it. I was blown away! I still can't believe anyone would go out of their way like that! I became such an expert on using this machine. I even had an old copy of the manual. Everything I needed to know was in there. Just today, I oiled the whole machine, and all I had to do was follow the directions. Waaay cool. I made pillows for my house, tried to make clothes to wear. I even made a princess dress for my daughter...."Mommy, this is the dress I been dreaming" is what she said. I fixed things and created things. 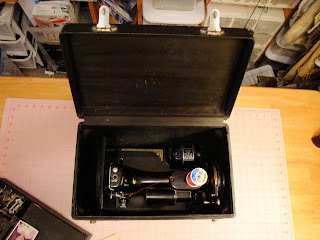 All on this one little, adorable sewing machine. I never really thought about one day looking back on a machine and feeling such sweet memories associated with it. 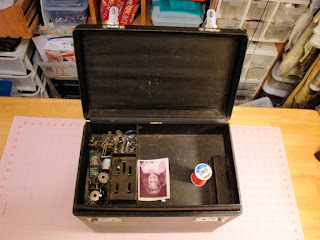 It has all the parts, and I even found an old school picture of my girl in the case. I think I will leave it there. Maybe it was a clue that it would one day be on it's way over to her house. What do you think? 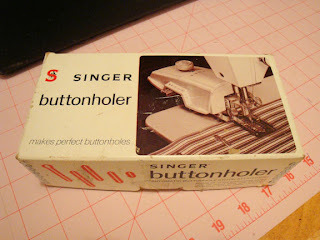 I never did use the buttonholer. Maybe she will figure it out. I have enough trouble with the one on my current machine!! So, it's goodbye to my little "Featherweight". I can't wait to see what she creates with it. I wouldn't dream of parting with it for anyone else.